The group of Osaka University, which is led by Dr. Sasaki, was the first to synthesize Cesium Lithium Borate Crystal CsLiB6O10 (CLBO), which is a nonlinear optical crystal (NLO), 1993. Compared with a conventional NLO (β-BaB2O4 (BBO)), this new crystal has a wide transparent wavelength region (2.7μm to 180nm) and birefringence suitable for the generation of ultraviolet radiation, so that it was expected that it would be an optimum NLO for deep-ultraviolet radiation through the generation of the fourth and the fifth-harmonics. Putting this crystal to practical use, however, was considered difficult to realize because of cracking or opacity resultingfrom the crystal's moisture absorption property. 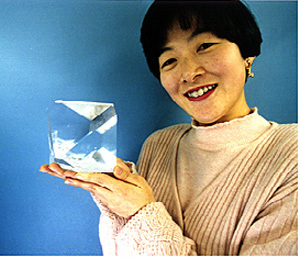 Under this circumstance, Dr. Sasaki and his team, after 20 years of painstaking efforts to develop quality improvement technology, finally removed impurities and point defects present in crystals and, at the same time, achieved the establishment of technology for growing large-size single crystals, the commercialization of the crystal as an optical element, and the generation of deep-ultraviolet radiation (266nm) of the highest output (42W) in the world. Examples of specific applications of CLBO are a photomask inspection light source for lithography of 45nm node and subsequent generations, a light source for the laser processing of micro via holes of 10μm or less in diameter, and many all-solid lasers for the generation of ultraviolet radiation. The new optical crystal CLBO originated in Japan has already established itself as a global standard component indispensable for semiconductor manufacturing systems. Due to the aforesaid reasons, the three researchers, Dr. Sasaki, Dr. Mori, and Dr. Yoshimura, will be awardees of the 14th Yamazaki-Teiichi Prize in the field of materials. Repeating several wavelength conversions of infrared laser beams using nonlinear optical borate crystals provides deep-ultraviolet laser beams having outstanding properties for creating a tightly focused spot and micromachining transparent materials. Such deep-ultraviolet laser beams were expected to be used for a wide range of applications in the fields of advanced measurement and processing because they were superior in tighter focusing to excimer lasers of the same deep-ultraviolet region, which were used for semiconductor lithography, and could be scanned at high speed. In the first half of the 1990s, boric acid-based nonlinear optical borate crystals mainly in overseas countries, but the conversion characteristic of the short-wavelength deep-ultraviolet region and unsatisfactory crystal quality hindered practical use. The winners sought after a material by introducing the concept of mixed crystals, which was not considered at that time, to boric acid-based oxides and discovered in 1993 that the new substance CsLiB6O10 (CLBO) with a different crystal system could be synthesized by mixing the existing LiB3O5 (LBO) and CsB3O5 (CBO) (a patent was granted in Japan, the U.S., and Europe). They revealed the single crystal growth conditions based on an equilibrium diagram made by them and then succeeded in producing the ultra-large crystal shown in Figure 1 in 1995 by gradually increasing the size of a microcrystal through repetitive growth from micro crystal. In addition, they were the first in the world to measure the refractive index dispersion and nonlinear optical constant, theoretically predict the generation of the fourth harmonic wave (266nm) and the fifth harmonic wave (213nm) of Nd:YAG laser, and demonstrate various wavelength conversions. It was also confirmed that CLBO outperforms existing crystals in conversion characteristic in connection with the generation of deep-ultraviolet laser beams with a wavelength of 300nm or less. On the other hand, the industrial commercialization of CLBO was considered difficult because of such problems as cracking in optical elements attributable to deliquescency and the variation of the refractive index. The winners perseveringly endeavored to resolve these problems, and ascertained that hydrates formed on the surface of the crystal would cause strain and cracking and that ultraviolet radiation could be generated stably by heating the crystal. In addition, they found out that cracking and other problems were related closely to crystal quality, and developed a system designed to produce forced convection in a growing solution of high viscosity by inserting a special propeller. They also established a technology, which conversely uses moisture absorption and deliquescency of crystals and manufactures high-purity materials through the chemical reaction and synthesis of raw materials in a water solution. These material synthesis and growing processes helped improve crystal quality, and in 2002, the winners succeeded in generating 266nm light of 42W, the highest output in the world. Another discovery of the winners is that the thorough removal of water molecules, or impurities, from optical devices by dry heat treatment is effective in significantly improving ultraviolet radiation-induced thermal phase mismatch (low conversion efficiency) and ultraviolet radiation-induced refractive index change resistance (device life). This technology enabled them to successfully generate 213nm light of 10W, which was the highest output in the world, and resolve the drop of output (life) over time with a deep-ultraviolet light source for semiconductor inspections, which was a serious problem around 2007. This achievement made it possible to stably use CLBO in semiconductor manufacturing processes for a long time, and, in consequence, CLBO was widely used in the world as an integral part of deep-ultraviolet laser beam sources for photomask inspection systems for high-density LSIs (Figure 2). On the other hand, existing crystals contained much light path-like scattering (point defects) and were confronted with the problem of short life when necessary high-output light was generated in the field of micromachining . The winners made efforts to reduce these point defects, and succeeded in developing CLBO with low defect density, which increases the life of ultraviolet radiation elements about twice or more than conventional crystals, in 2013. In connection with photomask inspections for high-density LSIs, inspection systems provided with a deep-ultraviolet laser beam source using CLBO are introduced on a global scale, from the half pitch 45nm generation processes to the latest 22nm and 14nm processes. CLBO thus makes a contribution to the commercialization of today's electronic components. In addition, in inspections of nanoparticles on silicon wafers, the method of detecting faint scattered light by irradiating deep-ultraviolet radiation generated by CLBO to wafers is a standard technology. In the manufacture of leading-edge components requiring high-efficiency fine packaging, the fourth harmonic wave (266nm) light source excellent in absorption characteristic into materials is needed to realize fine micro via holes of 10μmφ in diameter and to process woven glass reinforced epoxy resin substrates, which are the mainstream of printed circuit board materials but difficult to process. 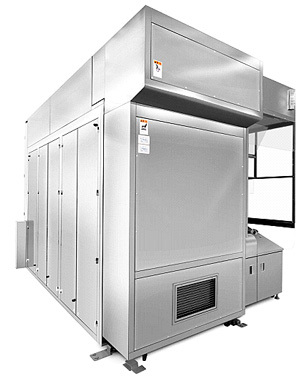 High-output 266nm ultraviolet light sources are also desired strongly for low-k wafers, three-dimensional packaging and dicing, and the processing of transparent conductive oxides (ITOs) for touch screens, sapphire, GaN, SiC, etc. CLBO is adopted as the only nonlinear optical borate crystal that can realize a light source for these deep-ultraviolet processing applications, and light sources and processing machines using it are in the process of being developed on a global scale.